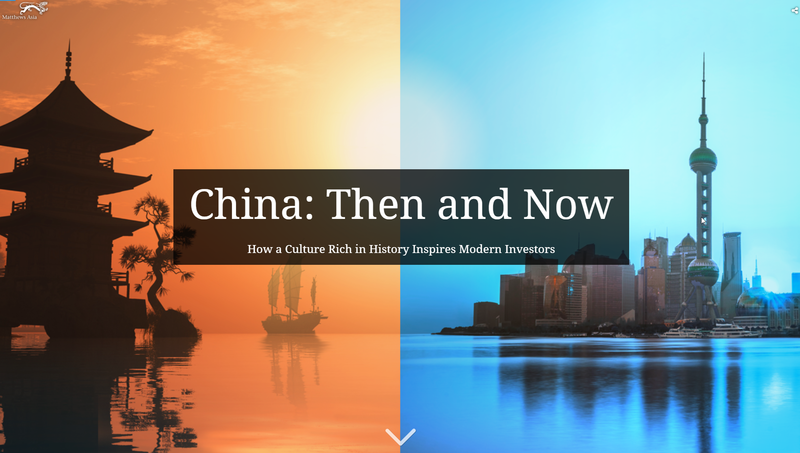 Recently, Matthews Asia collaborated with Blue Raster to launch “China: Then and Now”, a new story map spotlighting China’s economic transformation. The story map explores China’s demographics, rapid adoption of mobile technology, and innovations in health care. The story map begins with a historical overview of Ancient Chinese innovations, and then transitions into exploring today’s Modern China. It concludes with a look at how modern investors are incorporating investment opportunities in China to create globally diversified portfolios. To ensure the story map would be easy to navigate, easy to share, and easy to engage with, our team leveraged Esri’s Cascade story map template. Taking inspiration from Esri’s “Two Koreas” story map, our team created a color scheme and story board that reinforced the juxtaposition between Ancient and Modern China. To create a consistent storytelling narrative, we placed all graphics relating to Ancient China on the left side of the story map, and tinted them with warm shades reminiscent of Ancient Chinese traditions (Chinese lanterns, calligraphy, and architecture). We chose a palette of deep reds, warm yellows, and tans, and wove in pulp & paper-textures to continue the authentic feeling. To ensure the maps also felt authentic, our team customized a vector basemap to recreate the look of antique maps from that era. For Modern China, we placed visuals on the right side of the story map, and tinted them cool, neon tones that reinforced a futuristic, innovative feeling of today’s China. Check out the “China: Then and Now” story map today! Ready to dive into story maps? Contact our story map experts below to get started today.